Many dancers, singers and actors learnt on the job. From the 1880s to the 1940s that job was often in a J. C. Williamson and Company theatre, and sometimes in a J. C. Williamson production. The theatres hosted ballets, pantomimes, plays and Gilbert and Sullivan operas. The touring companies that used J. C. Williamson’s theatres often employed locals to fill out a chorus line or perform bit parts. 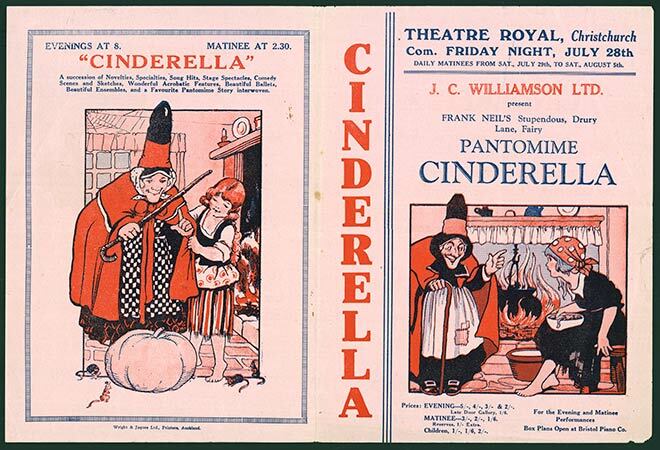 The 1933 tour of the pantomime Cinderella (whose programme is shown here) came from Britain–the source of many of the companies that toured New Zealand at this time. The company provided more than on-the-job training of art education in New Zealand. Many dance teachers were former J.C. Williamson dancers. As well as teaching dance, they brought stage experience and the ability to direct and produce shows to towns and cities around the country, putting on end-of-year shows and fundraising events for all kinds of causes.